"They know there’s still gold in the hills. Cyclists know it, too: they climb and climb just to know that this is the top. When I moved to Colorado from New York City, I wanted to do all the impressive things. Locals of Boulder tend to roll their eyes whenever they see someone doing something ridiculous—like biking the steepest road during a snow storm—but they also feel a pang of jealousy: a bit of, I should get out and climb a bigger hill. I wanted to be that dedicated to doing things just for the sake of the experience. Boulder is seen by the rest of the world as quirky and liberal and extreme. I started reading books and magazines about where to bike in the area. Anytime I mentioned a ride that I considered challenging, someone told me about a road twice as tough. At dinner with some native friends, I humble-bragged about finally riding all of Flagstaff Road—maybe the most popular climb in the area, and one that I could barely do half of the first time I attempted it—and was immediately told I needed to ride to Ward, and eventually on to Brainard Lake: almost 5,000 feet of climbing in less than 22 miles, ending at 10,300 feet. I planned a trip for the following week. Ward, Colorado, was established in 1860, when the only reason to be in Colorado was gold, and gold was a good reason to be in Ward. The town was officially incorporated in 1896, and it was another two years before the railroad was built. In its heyday, during the Colorado Gold Rush, Ward had a population of around 500 people; since then, there have been several fluctuations—mostly declines—and stints when the year-round population plunged to between 4 and 10 residents. The air we breathe contains right around 20% oxygen no matter what the altitude. But as you go higher, the pressure makes it feel as though there’s less oxygen. Above 8,000 feet, it feels like less than 15%. (Everest has what feels like 7%.) I spent my first summer in Colorado living in Leadville, the highest incorporated town in the United States, at 10,200 feet. In New York, I could easily run 15 miles or more. In Leadville, it took most of the summer before I could run 3 miles without stopping. I bike alone. It’s not that I’m against riding with others—I’ve been told over and over that pack riding would make me faster—it’s just that I like to go at my own pace, and decide to change my route at the last minute. I change my route at the last minute a lot. I also just like to be alone, even when that makes things a lot more intimidating. In New York City, one is never alone: I used to wake before sunrise, just to have the park or the bike path un-chaotic with traffic. And the times that I’ve joined up with group rides I’ve felt like I was chasing, and overly aware of numbers. What’s my cadence, what’s my speed, what’s my wattage? I’d rather think about things like, what exactly would I do if I encountered a moose or a bear while traveling uphill in the middle of nowhere? The Rapha Cycling Club/brand was founded in the early 2000s by British entrepreneurs Simon Mottram and Luke Scheybeler. They took the name from the 1950s cycling team, Saint Raphaël, who had taken the name from an apéritif company. The inventor of the herbal tonic recipe had failing eyesight, and recalled a biblical story of curing blindness with quinine. He used cinchona for his drink, and his sight was eventually restored. By coincidence, the race director for the St. Raphaël team nearly died of malaria after racing in Africa, were it not for the quinine he was given (though, not in the form of cocktails). Today, Rapha’s signature colors are bright pink and grey: it’s easy to identify when someone is in the club. Membership dues are $200 per year, and allow access to a members-only line of gear; essentially, their already expensive clothing, but with “RCC” sewn on. Rapha stores sell a pair of socks for $50. These days, it’s not that the people of Ward are poor, though one might think that upon arriving. Boulder residents tend to see the people of Ward as eccentric and unconventional, if not crazy. But it’s more that they’re sustainable: aware of their means, and their place. Structures are old and simple. Roads turn to dirt. Rust is the theme. Nothing is bright pink, but something in the air makes it feel like stumbling upon gold is still possible. The ride from Boulder to Ward is all up: there are no flat or downhill breaks at all. Going up for so long means going slow: you notice everything on the road. Moose droppings look like smashed Milk Duds. People seem to lose a lot of single shoes. Any headwind at all seems totally defeating. Besides gold, there was also silver in the area. A single mine in Ward produced more than 2 million ounces, or 62 tons, of silver. But at the beginning of 1900, a fire burned most of the town to the ground. Wind gusts of 90 mph aren’t abnormal, and any version of fire is almost always devastating, even today. Things can be entirely calm one moment, then a gust of wind that will literally stop you the next. The town rebuilt because of the success of the mines, but things were never quite the same after the destruction of almost all major buildings in the area. Rapha has chapters and clubhouses all over the world; places like Amsterdam, Copenhagen, London, Tokyo, and Boulder. Each month, they sponsor group rides to the most picturesque roads and refueling spots in the area. Rapha wear is encouraged, but not required. 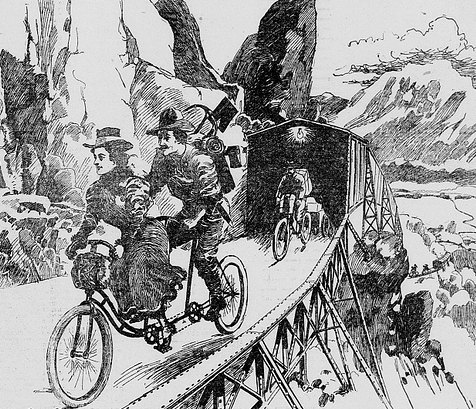 It’s an elitist community that provides the idea of epic cycling: evokes something raw from the past. One of the only surviving structures in Ward from before the fire of 1900 is the church, which has come to be one of the most-painted buildings by artists in Colorado. Georgia O’Keeffe painted the church when she visited Ward in 1917. It was originally built to entice the railroad: they wanted to present Ward as an upstanding town, so they built the Union Congregational Church, and opened it to any denomination. That same year, the railroad was completed. The road to Ward is paved and well-maintained, but littered with decades-old cars and trucks. Every time I make the trip, I imagine the drivers reached deep snow and just walked away. Or that the wind opened their doors and took them. There are also various artist studios and hunting cabins along the way. People off the grid, playing by their own rules. Just before the last push—less than a mile from Ward—there’s a natural spring with a pump on the side of the road. There are always locals filling up gallon jugs (I’ve heard them call it the purest water on earth), and cyclists filling and refilling their bottles. Sometimes there’s a line of people waiting. The pump house is above Brainard Lake and travels through pipes to the houses in Ward and to the public pump. Maybe it’s because of the climb, but that water always tastes better than wine. And it’s free. To the weekend cyclist, the only thing that seems to remain in Ward is the Utica Street Market. Although the market/house is up for sale (and has been for a year), the inventory is stocked to the gills. Cash only. On a sunny weekend day, the wrap-around porch is decorated with lounging cyclists, many dressed in fancy Rapha kits, enjoying any candy bar or other sugar-fix they can find. There’s coffee and homemade goodies. There’s Chapstick and all the things you didn’t think to bring: the weather is different above 8,000 feet, sometimes drastically so. Ward also has a sometimes-operational Italian restaurant, a volunteer fire department, an honor-system library, a schoolhouse-turned-post office, town hall, and a posse of dogs that line the main road. The old hotel and train depot have been turned in to residences. If you talk to the right person, you can get various theories on a UFO sighting at the old sawmill in 1929. The definition of “weird” gets stretched a bit in Ward, and the residents love it. Not far from Ward is the town of Gold Hill: a small community of dirt roads, including Lickskillet, the steepest county road in America. Gold Hill has the oldest continuously operated public school in Colorado, and a similar history to Ward—devastated by the same fire. But people remain. They know that there’s still gold in the hills. Cyclists know it, too: they climb and climb just to see the church, the general store, the one-room schoolhouse, the town pump. Just to know that this is the top: that they are rich. This past August, Rapha announced that it had sold to the grandsons of Sam Walton, founder of Walmart, synonymous with cheap American goods. Reports estimated the purchase at around $260 million. Rapha won’t likely be selling their high-quality gear at Walmart anytime soon, but things will change. I’m trying to stick with the things that aren’t changing: I’m learning about the logistics of the bicycle—what makes it work; I’m finding the roads that have been in Colorado for over 100 years, and respecting the things that are bigger than me, like wind and elevation, and moose. Change is, of course, inevitable, but it’s nice to know what’s lasting and pure. The thing about mines is, eventually, they’re tapped out.